UnitedHealth Group (UNH) has made an impressive rise over the years, but since April a bearish divergence has been building and a downward correction is overdue. Let's review the charts and indicators of this health care leader. In this daily bar chart of UNH, below, we can see a mixed state of affairs. Prices are above the rising 50-day moving average line but the line was tested and temporarily broken this month. The last time this indicator was tested was back in February and March. The daily On-Balance-Volume (OBV) line has moved up the past 12 months but its rise has not kept up with the price gains. Prices made a common gap to the upside yesterday but we have not seen upside follow-through. In the lower panel is the 12-day momentum study. Take notice: price momentum has been slowing since April. The share price of UNH has been going up but at a slower and slower pace. This is a bearish divergence when compared to the price action. Divergences can be poor and inconclusive timing tools but that does not mean we should ignore divergences that go on for six or seven months. In this weekly bar chart of UNH, below, we can see that the rally in UNH has been long and strong. This is the picture of a buy and hold security. Prices have stayed above the rising 40-week moving average line for nearly three years! The weekly OBV line shows a general rise over the past three years but it has been flat to down recently. In the lower panel is the 12-week momentum indicator which shows a slowing of momentum from June. These are not obvious sell signals but that is how investors can be surprised. 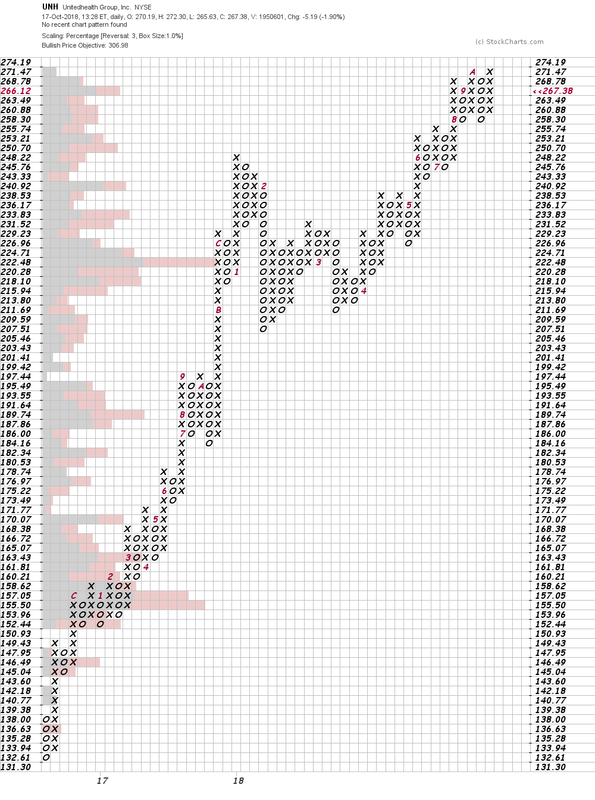 In this Point and Figure chart of UNH, below, we can see another upside price target but that is not what I want to focus on. A trade at $274.19 will be a small double top breakout but a decline to $255.74 will be a short-term negative. Bottom line strategy: We don't have a distribution pattern or topping pattern on UNH, but the slowing momentum on a daily and weekly scale tells me this is not the time to press one's bet. Longs should raise sell stops to a close below $255.